Situated among the scrub oaks and long-leaf pines in this remote area of New Hanover County is a quaint three-room church which might be the “Mother” Methodist Church in North Carolina. ‘I think it’s considered the “Mother” Methodist Church in the state,’ said V. E. Queen, Methodist district superintendent. There are no records available to confirm, or discredit, Federal Point Methodist Church as being the original Methodist Church in the state. At any rate, the church is definitely more than 112 years old, and may possibly be 162 years old. Some of the valuable old records in the basement of the historic old New Hanover County Courthouse, which date back to the early 1700’s throw some light on the subject, but there are years which slipped by unrecorded, leaving a vast area of unknown which only speculation can fill. On July 14, 1725, the Commonwealth of North Carolina deeded to Maurice Moore, “500 acres, more or less,” at the southeastern corner of New Hanover County. That 500 acres today takes in Kure Beach and Fort Fisher. Moore acquired the land because as a major in the army, he had led some troops across the Cape Fear River and landed in the vicinity of Sugar Loaf Hill, a few hundred yards north of Federal Point. Moore expressed the desire to establish a settlement around Sugar Loaf and Federal Point, and did so. At the same time he got the land for a settlement at Federal Point, Major Moore was building a plantation on a overlooking the Cape Fear River, just north of Orton Plantation. It wasn’t until the spring of 1736 that the 500 acres which Moore had acquired, changed hands. Thomas Merrick took over the vast stretch of sandy wasteland from Moore. Merrick had two daughters, Dorothy and Sarah. In his will, Merrick directed that all his land be divided equally between his daughters. Dorothy died without marrying, and Sarah was sole heir to the acres of sand, bordered on the south and east by the ocean, on the west by the Cape Fear River, and on the north by a boundary line. Sarah Merrick married Samuel Ashe, Jr., and in 1788, they sold the southern half of their land to Archibald McLaine, and in 1792, they sold the remaining tract to William Mosely. Moser didn’t hold onto the 300 acres he bought, very long, because on April 12, 1794, he sold his holdings at Federal Point to Joseph Newton. Some 49 years had passed from the time the state gave 500 acres to Major Maurice Moore, and Joseph Newton bought 300 acres of the same tract. It was on the 300 acres bought by Joseph Newton that the Federal Point Methodist Church was built. It is entirely possible that a hand-full of people began holding simple worship services on the land of Joseph Newton soon after he bought it. This speculation is strengthened by the knowledge that a settlement existed at Federal Point during that time, and there is reason to believe those settlers were religious. Being far removed from the church facilities afforded by Wilmington, it is reasonable to assume they had their own makeshift services. They may have congregated at Newton’s home on Sundays, then sometime later built a small meeting place which came to be known as the ‘Meeting House.’ New Hanover historian Louis T. Moore has no records on the Federal Point Methodist Church, but he has some ideas in connection with its beginning. Moore, a direct descendant of Maurice Moore, the original owner of the land, agrees that a group could have held church meetings at Joseph Newton’s home as early as 1794, “But I doubt it. It is more likely that Federal Point Methodist Church was organized in the early eighteen hundreds, following the arrival of the Rev. William Meredith,” Moore said. The Rev. Mr. Meredith came to Wilmington in 1797, and is regarded as the first Methodist minister in this area. Grace Methodist Church, which was organized in Wilmington, by the Rev. Mr. Meredith in 1797, is considered by historian Moore, as being the oldest Methodist Church in the state. There is no doubt that the arrival of the Rev. Mr. Meredith in this area the Methodist movement in this section, but there is still the contention that a group was meeting at Joseph Newton’s home before the Rev. Mr. Meredith came. It was on the 50 acres owned by Edward that the old Joseph Newton homeplace stood. However, no mention is made of when the Meeting House was built, or when the people first got together, and started holding religious services. We know that it was sometime between April 12, 1794, when Joseph Newton bought the land, and January 15, 1844, when Edward made reference to the Meeting House in his will. There is considerable more history to the church, especially the part it played in the War Between the States, when the cannons at nearby Fort Fisher rattled the very foundations the Meeting House stood on, but that is a part of the mystery of its beginning. It is a romantic history indeed, and a history which easily stirs the imagination, and returns our thoughts to those days of yesteryear. 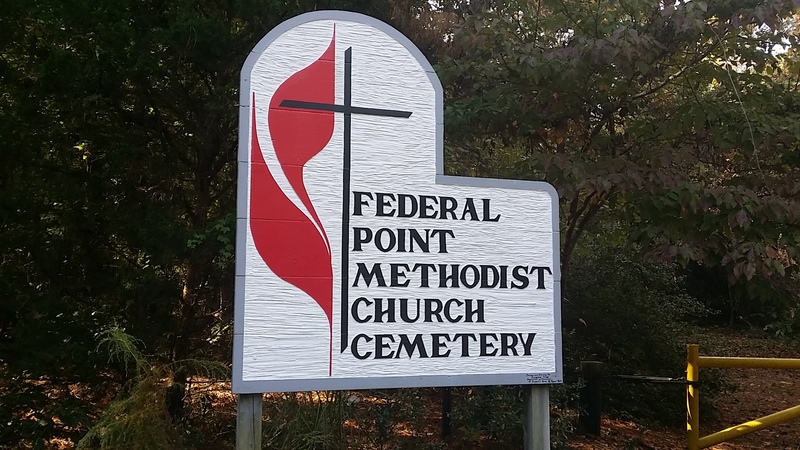 The historic old Federal Point Methodist Church will be abandoned soon because it is located in the area designated as a ‘safety zone’ for the Sunny Point Army Terminal. According to an agreement between the church and the government, the graveyard beside the church can still be used, and the government will provide maintenance for the burial ground. At the present time,  there are about 30 members of the church, and the pastor is Douglas Nathan Byrd, a ministerial student at High Point College. 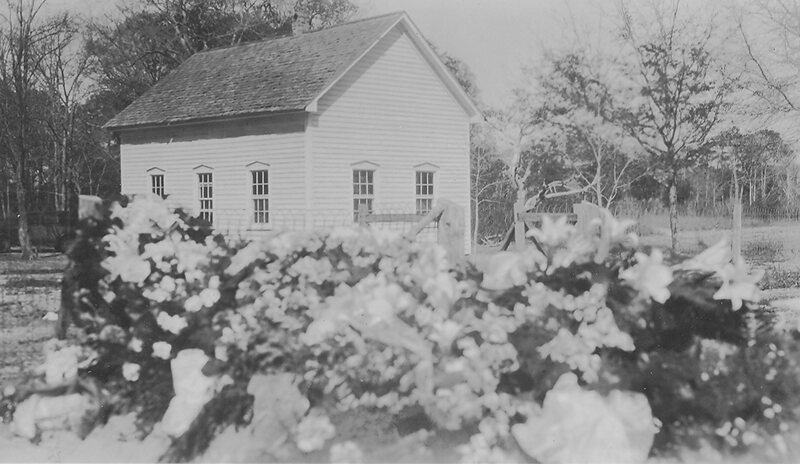 The present building was erected between 1910-12, and is located some 300 yards northeast of the site of the original Meeting House.